This is the Outer Banks Bear Factory’s online store. 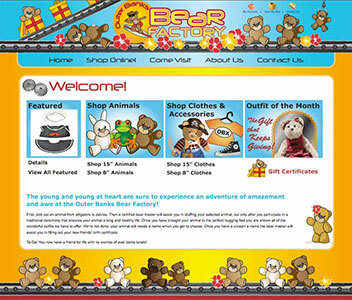 The Outer Banks Bear Factory requested a custom online store where their clients can view products and safely place orders. They wanted to extend the Outer Banks experience of building your own bear online so that their customers that built their bear at the factory on the Outer Banks could shop throughout the year for outfits and accessories. The site was meant to attract children to have a fun online experience shopping for items for their bear. The surfing bear logo as well as the playful factory belt header were custom illustrated and carried throughout the site. The store experience was easy to use, and the owners could easily add and edit products keeping their offerings fresh for visitors, and announcing holiday specials.